What does “Intergenerational Solidarity” really mean? Posted 23rd May 2016 & filed under Blog, Intergenerational Justice. Travelling on the London Underground last week, I gave up my seat to an elderly gentleman. He was grateful and very charming and it became clear to me that he was well-off and on his way to work – and he was probably well beyond the state pension age. He told me with some pleasure that he was travelling for free by using his “Freedom Pass”. Obviously I was totally happy about giving up my seat but I couldn’t quite bring myself to believe that it was right that he was getting to work at the government’s expense. I felt strong solidarity with him as an individual but no solidarity at all with the policy of giving him this state hand-out. Solidarity has been an important concept in continental Europe since 1945 and has often been used as a rallying cry to get disparate groups to work together for a common goal. The term “solidarity” was used, for example by Lech Walesa in the 1980s in Poland to galvanise ship workers and others into demanding change and eventually the dismantling of the Communist regime. “Intergenerational Solidarity” has been a plank of European policy for several years and this peaked in 2012, which was the year of “solidarity between generations”, but the term means different things to different people. To the EU Commission it seems to have meant something like: “support welfare benefits for old people, support a few youth initiatives and let’s paper over the tensions that exist between generations”. A typical advocate of this view is Age Platform Europe, who work for the over-50s in European politics and they describe their work as “focused on a wide range of policy areas that impact older and retired people. These include…. Intergenerational Solidarity”. To the extent that the term Intergenerational Solidarity means caring for vulnerable older people, wanting a more integrated society and working for more sharing of knowledge and experience between generations, surely every thoughtful person must support that, just as every civilised person would favour giving up a seat on a train to a needy passenger. Intergenerational Solidarity is also a good slogan for fighting the scourge of loneliness that affects both young and old in our European societies. However, there is a serious danger that people are using the Intergenerational Solidarity term to mean that you mustn’t ever challenge the claims of older people, even when these seem excessive or unaffordable. But it must, surely, be justifiable to cry “foul” if, as a group, the older generation have taken more than their fair share in housing, pensions, tax breaks and other resources. Young people who question the distribution of economic advantage between cohorts can consistently support vulnerable older people. They can reasonably both (a) care about the needs of older citizens and (b) reasonably challenge the way that leaders of older generations have rigged the welfare state against younger claimants. There is a real danger that “Intergenerational Solidarity” as a term is being used to neuter the protests of the young and to prevent legitimate discussion about a fair generational distribution. 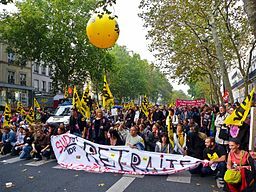 In 2010, France’s student unions went on strike in protest at the government’s plans to raise the retirement age, in the name of solidarity with older workers – accepting, or perhaps failing to see, that the younger generation would have to bear the burden of the inevitable cost of not raising the retirement age. At a recent meeting in Brussels I asked a prominent youth campaigner about intergenerational fairness and she said that she believed that across Europe young people are getting a very raw deal and even described the system as being systematically “rigged against them”. Despite this she sticks to the convention in European policy circles to prefer the term Intergenerational Solidarity over “intergenerational fairness”. My view is that we Europeans need to wake up to a key problem that lies at the heart of Europe’s current malaise – a tendency across the continent to give economic advantage to the old at the direct expense of younger and future generations. The Intergenerational Foundation has recently published the IF European Intergenerational Fairness Index 2016, which underpins this view statistically. Image: Demonstrators under the banner of the trade union Sud-PTT against the pension reform, Paris, France, 2 October 2010. Photo: Myrabella / Wikimedia Commons, via Wikimedia Commons.